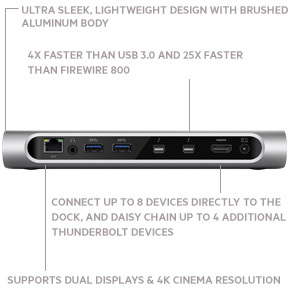 Thunderbolt™ 2 Express Dock HD with Cable is rated 2.6 out of 5 by 19. The original Thunderbolt Express Dock transfers files at an incredible 10 Gbps. The Thunderbolt 2 technology inside the Belkin Thunderbolt 2 Express Dock HD allows you to transfer at twice that speed - an unprecedented 20 Gbps. That's 4x faster than USB 3.0 and a whopping 25x times faster than Firewire 800. 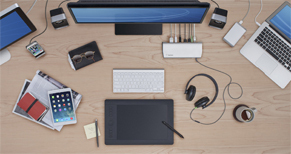 With the Belkin Thunderbolt 2 Express Dock HD, your need for speed has been satisfied. Rated 5 out of 5 by Stereoscope from Has been working well for about 2 years! I bought this for my 2011 MacBook Pro (since it featured a Thunderbolt port and USB 2.0) - I wanted to keep it as current as possible, and this hub has delivered to that end. I can hook up an HDMI external display, while connecting 3 usb 3.0 drives and daisy-chain 3 more Thunderbolt drives. I couldn't do that before with what my MacBook has by default. Rated 5 out of 5 by Tech_Terry from I have every port/connection is use. Works great. No problems. Almost meets my needs. I guess I may need a second one. Would love to have e-SATA. Rated 1 out of 5 by Prabhat from Does not work well 2 monitors do not work well. Also, the headphone jack does not work. Not useful at all. Rated 5 out of 5 by ben8 from Outstanding Product. Don't believe 1-star reviews I love this device. It takes the single Thunderbolt port on my Macbook air and gives me a whole bunch of other ports. It's amazing! It has always been plug and play with me. I do drive a second monitor that happens to be DVI off this hub. I use a Minidisplay to DVI converter for that. It works great. The people giving it 1-star reviews are doing so because they don't know how monitor technology works and are probably trying to hook up two very old monitors to a new computer. These incompatibilities are not Belkin's fault, and they shouldn't be giving this product 1-star because they are, shall we say, challenged by technology. Rated 5 out of 5 by Shakey from Works a treat! Just right. Purchased for my partner as she travels with her macbook pro and needs to unplug everything to head out. She has an older second screen – we attached that using HDMI to VGI – worked fine; We have a powered 7 USB (with several slots to sparespare) hub attached to one USB – and everything seems to work (back up discs, printer etc): web Camera to another USB port – all good; have attached the Ethernet cable – all good; which means that there are two spare USB, a HDMI and one more thunderbolt on the computer - for temporary thingys. Brilliant. So the success is that there is just one cable plus the power cable to be removed when she takes the computer away – which is often. She is very happy with that compared to the former when it took her ages to figure out what where etc. Now – just one problem – I want one – but not yet convinced myself to pay the price a second time. Rated 1 out of 5 by IT Dude from Junk Came with zero instructions, and no way to connect to a PC or laptop unless it has a special thunderbolt connector. Strike 2 on thunderbolt 2 belkin, junk it and try again. i will stick to buying belkin cables only. Rated 1 out of 5 by mjervin from 2nd monitors and internet fail to work regularly I purchased this last fall and have been struggling with it ever since. Using a Displayport connection to my Macbook Pro via Thunderbolt I find at least once a week it will not connect. If I connect my Mac directly then it works every time. Recently the network connection has started to do the same thing. There really seems to be a problem with this device. Rated 1 out of 5 by Basil from Second monitor works sometimes The dock is a great idea but functions poorly. The dock has an HDMI port where you can attach a monitor and sometimes this connection works and most of the time it doesn't. You have to restart, maybe unplug decides, stand on your head. Its really no telling what will make the monitor connect. I have spent 30 mins to try to get the monitor to work when I could have spent a minute just connecting and disconnecting those same cables from my mac to make it work. For $300 this is a waste.